There’s a common myth that makes side projects close to impossible. 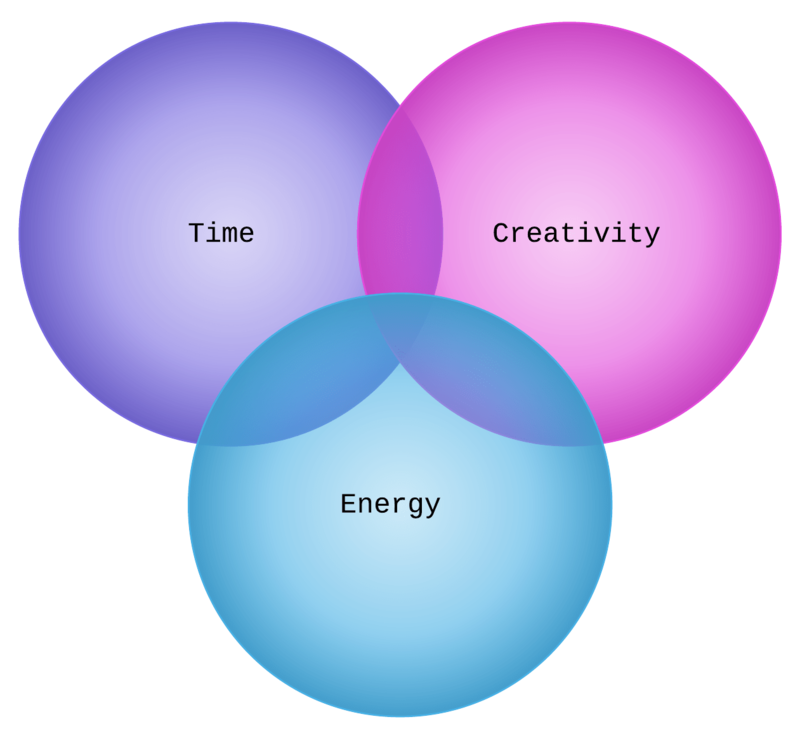 It’s thinking that side projects can only happen at the intersection of energy, creativity, and time. That’s a pretty high bar. That intersection doesn’t come around all that often. For me, it’s usually about day 3 of a 3 day weekend. The UK has 8 public holiday days a year… so that’s 8 days a year. Max. Say half of these work out, and on each you get 6 hours of solid work done. That’s a whopping… 24 hours a year. Don’t get me wrong. These may well be the best 24 hours of the year. But, we have 168 hours every week. What if we could carve out 4 of them, every week? Our side projects might start to move a lot faster… or at all. This comes down to: pick one thing. If you have too few ideas, well, you only need one. If you have too many, how do you pick? Solve a problem you face yourself. A university project you wanted to extend? Some feature of a platform you want to explore? (e.g. as an iOS dev I was keen to make something on Android that took advantage of intents). Art galleries (an art gallery in Hong Kong encouraged me to start coding on a side project I’d had in mind for a long time). Go somewhere to think: take a long walk, or go swimming (I solve so many problems and have so many ideas in the swimming pool). What is the closest to done? Finish things first. What can you build on later (i.e. projects that will teach you things to know in other, more complicated projects). What has fewer dependencies (e.g. your collaborator has gone AWOL). What will be most useful to learn. What is the best break from your day to day? Our energy is often sapped by work, especially when our work is not rewarding. We need side projects most when we are close to burn out, but that is often when we have the least energy. Days are often long in the tech industry, and work travel derails personal schedules and habits. Remind yourself what you love. Disconnect from the office over the year (focusing on something else is the best distraction). Small wins create bigger wins. Aim for the next minimum shippable improvement. There’s no need to be secretive. Where do You Draw Energy From? At one point, I was going home in tears several days a week. There were a lot of things wrong with my job at the time but here were the big two: 1) not shipping (for reasons outside of my control), and 2) not feeling appreciated. By focusing on side projects where I had control of the feature set, and the priorities, and all of it, I could decide when to ship. And of course it was a much lower bar, it was “here’s something interesting”, not “here is a new product!”. And when I started to put things that I was making, and writing, out into the world, people started to notice, and say nice things to me, and about my work, and I started to get the appreciation that I needed, and feel like I was doing things that were worthwhile. When I’ve thought that what I did all day at work was meaningless, creating things that people found useful redressed this balance. And even if I came home in tears, it helped me get up and do it again the following morning. And over time, it helped me gain the confidence to go and find a better place to be. And when I’ve felt like I don’t have much to say about my day-to-day, I have a story to tell about my side projects, and things that I’ve learned, and what I’ve built. Everyone is short on time, and the standard advice is “cut out TV”. I don’t think this is helpful advice, I think people watch TV because they are too tired to decide what else to do. Because it’s nice to escape. After a long day a great TV series is a way to absorb yourself in someone else’s life, and forget about the things you should be addressing in your own. Personally my rule is, TV is OK, but not just TV. I watch most of my TV in the gym, it’s a great way to get enough cardio. Especially with dramas, like Covert Affairs. She’s running… I’m running… there’s shooting.. faster faster! Or whilst writing unit tests. I decide what they should be, then fill in the mindless boilerplate (Java has a lot of mindless boilerplate) whilst Keeping Up With the Kardashians plays in the background. Because no side project is 100% fun, although I understand my comprehensive unit testing strategy is somewhat aberrational. There will always be some dull, or less demanding tasks. Like setting up your environment, or downloading bits and pieces. So “I’m tired, I’m just going to watch some TV” can become “I’m tired, I’m just going to watch some TV and do some [task requiring less concentration]”. And somehow, I’ve caught up with the Kardashians and also made some progress. Even if it wasn’t amazing progress, even if it took twice as long because what is she wearing? Progress is progress. The other advice is to find an hour before work. Definitely regardless of whether it is exercise or a side project, there’s something very powerful of knowing that whatever happens over the course of the rest of the day I have already done something that is just for me. Luckily I keep a very detailed task list, which includes blog posts I mean to write. So I just looked at what was at the top of the list, and wrote it. Draft over, I went to work. Then later I edited it and scheduled it. I live under the continual delusion that Future-Cate is going to be super-human, and I’m continually proven wrong. I’ve learned that Future-Cate in the morning is going to be a mindless zombie, so if I want her to crank out some of the stuff on my endless todo list, I need to make it really, really easy for her. Because future me, past me, and me as I write this, we’re all the same. We all find starting to be the hardest part. And yet in the throes of creativity, I never remember that. I think “what an amazing idea” as I pace up and down the swimming pool. I’m convinced that I will have it fully articulated within 30 minutes of walking in my front door. But actually by then I’m asleep and I forgot to hang my swimsuit out to dry, as well. You can do a lot with one hour, as long as none of it is spent wondering what to do, or looking for inspiration. Make your creative self put their brilliant ideas on a detailed task list, and your zombie self can probably knock one out before 8am. I love being a software engineer. I love making things, big things, as part of a team. I love working with designers, because I appreciate great aesthetics but can’t create them, and I love working with good product managers, who care deeply about and take the time to deeply understand the user so I can trust their judgement and focus on building, coding, testing. But my side projects, they are all about me. What I want to make, what I want to learn, what I’m inspired by. And so amid decisions I don’t agree with, be they product or engineering, when some guy shoves me out the way to get what he wants, my side projects are this space on the internet, on my computer that is all mine. Everything else, it’s just a technique for making progress, and these work! Try them! But really your side project starts in the place where you decide that you want to carve something out that is all for you. It might grow, or it might fail. But it’s yours. I had this idea for a side project, I was sure it was brilliant. Back in 2011. I wanted to be able to visualize a series of photos. I found the perfect layout (the sunflower layout) and then… did nothing with it. Later I returned to it and discovered that extracting the dominant color in an image was much more complicated than I had thought. I learned about different color spaces, the difference between HSB and RBG, and ended making my own image filters. Turned out, the original idea sucked. For starters, it takes forever to run. Secondly, it just doesn’t look as compelling as I thought it would! But making my own image filters became the main project, and later a book chapter. In so many ways, this project was a failure. Firstly, it’s kinda ugly. Second, it took nearly 3 years. But in other ways, it was a huge success. I applied some stuff that I’d had no need to apply before (the way images are just an array of pixels), and learned things about colour that I hadn’t previously known. And it was a great topic for a book chapter, and of course I’d had that common goal about seeing my name in print. It started, on one of those amazing 8 days of the year (although I lived in Ontario, Canada then, so technically it was 9). And really, it was a super fun day. But it ended up where it is because I found ways to carve out some time out of every week, every 168 hours, for the things I wanted to build, and that I wanted to write. 4 hours a week will get you further than you think. Even if it’s your little darling, baby side-project – it will be difficult. Waiting for a slip n’ slide to the mythical land of finished to appear is just like how it sounds – ridiculous.